Topical magnesium & herbs have been used for aches & pains for millennia, this is an all over body moisturiser, with Magnesium Chloride & Herbs. 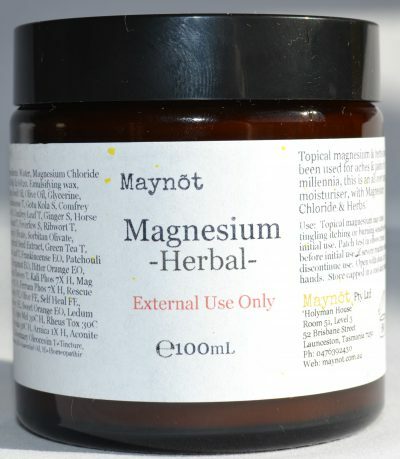 Use: Topical magnesium may cause tingling itching or burning sensation with initial use. Patch test in elbow crease before initial use, if severe reaction occurs discontinue use. Open with clean, dry hands. Store capped in a cool dark place. Ingredients: Water, Magnesium Saturate, Emulsifying Wax, Hemp Seed Oil, Olive Oil, Glycerine, Cetearyl Olivate, Sorbitan Olivate, Solomon’s Seal T, Fever Few T, Ginger S, Frankincense T, Myrrh T, Comfrey Leaf T, Comfrey Root T, Gotu Kola T, Green Tea T, Olive Leaf T, Grapefruit Seed Extract, Frankincense EO, Boswellia Serrata EO, Arnica T, Patchouli EO, Bergamot EO, Kali Phos 7X H, Mag Phos 7X H, Ferrum Phos 7X H, Sweet Orange EO, Ledum 30C H, Apis Mel 30C H, Rheus Tox 30C H, Bryonia 30C H, Arnica 1X H, Aconite 1X H, Rescue Remedy FE, Olive FE, Self Heal FE, Comfrey FE, Rosemary Oleoresin. T=Tincture, S=Succus, EO=Essential Oil, H=Homeopathic.